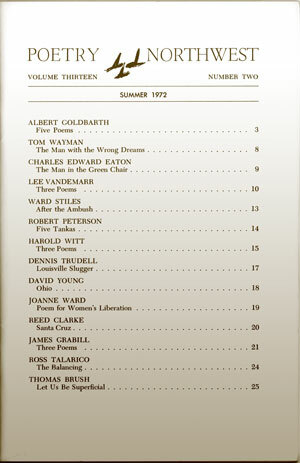 Editors’ note: Thumbing through the Poetry Northwest archives, many names appear with pleasing frequency, and Albert Goldbarth’s as often as any—particularly in the magazine’s early days with David Wagoner as editor. One finds already in those early-published poems the strobe of wit and intelligence we’ve come to expect from Albert Goldbarth’s poetry and prose. On the occasion of his visit to Seattle and of the publication of his new book of poems, Everyday People, we bring you five poems as they originally appeared in two vintage issues of Poetry Northwest, featured here with the poet’s own reflection on what these pieces mean to him now. Look for more from the archives in months to come! On Thursday, February 9, 2012, Albert Goldbarth will read as part of the Seattle Arts & Lectures Poetry Series. Details here. 1971—forty-one years ago! I was twenty-three when “Village Wizard” and “The Death of the Printed Page” appeared in Poetry Northwest, probably twenty-two when they were written. The cells of my body have completely replaced themselves six times since then. Whoever that “Albert Goldbarth” was, he isn’t me. And yet I remember so clearly the day that acceptance letter arrived. These weren’t technically my first published poems (I believe we’d need to go back to 1969 for that) but they were the first to be taken for a journal that I recognized as nationally available (in Chicago, in those days, DeBoer distributed it to a prominent downtown bookstore) and that I’d been reading with a novitiate’s deep passions from before my attempts to submit. There were names in its tables of contents I recognized, and the poems of editor David Wagoner were already favorites of mine (and remain so today: I’ll be teaching him in a graduate poetry workshop this week). I remember dancing, whooping, around the living room table after I read that acceptance letter (Tom Cruise later copied my moves for a famous scene in Risky Business). I can’t imagine what could cue such a physically jubilant response today. I’d never met or corresponded with David Wagoner, I’d never at the time set foot in the Northwest; and that early moment of small validation, among others, cemented my working sensibility from then on: no networking, no multiple submissions, just faith in the poems themselves and in the honesty of the editorial process. This remains true for all of the poems Xeroxed from the Poetry Northwest archives and mailed my way: someone else wrote them; but he was clearly a progenitor, a proto-me. The self-referentiality in “Things I’ve Put Into This Poem,” and its willingness to use its own vertical layering of lines as an indication of passing time, have kinship with gestures in more current work. Ditto the celebratory long-windedness and overspilling population of “The First Amendment to the Constitution of the United States”; and, in a very different poem and different voice, the tendency toward maxim in “Against the Odor” (“Every six seconds the blink lies / to the fovea”), as well as its willingness to morph scientific and historical facts into imaginative metaphors. Later collected in a published volume, or long-gone on the winds of chance, these poems are the first of what must have been a few dozen to appear in the magazine over the years, and David Wagoner’s generosity provided me with an important testing ground, showcase, and early self-identity as a poet working in, and for, a like-minded community. I felt that wonderful mixture of humble and proud, at being invited to join. It happens that the pure serendipity of the Xeroxing process also brings me Poetry Northwest poems and part-poems—printed right before or right after my own work—by Tom Wayman and Dave Etter, and part of a contents page with names like Michael Harper, Eve Triem, Robert Hershon, Greg Kuzma…names that filled the pages of the literary journals of the 1970’s…all of them, “my people,” all of them poets worth knowing still. with a dozen coins in his purse. Waziri cut the umbilical cord. fading across my skin. It is cold, a time for migration. from their drying pods. This is a pun and a metaphor. That was a pun and a metaphor. markers disappeared. The grand thesaurus of silence. now, a wail: of ooo’s and aaa’s in a wordless dirge. vanished, at the end of life. We can only comfort their final hours. of English and American Literature. This is the finish. Turn to the start. Whisper the hymns of Anonymous. reflects in water. We cannot talk to mirrors. And now no living page is left with living contents, or ever read. Of course this is silly. her hair makes in wind, over green leas fleecy with primrose. spaded up from history to shine between her breasts. packed in red dirt where the heart was. the country doctor poises an inch above his chest. of a dying man to chew a lead bullet in half. of fainting: he feels the fever go into the sweat, and leave. The pain goes into the bullet. So I’ve put some special things in this poem. I put in so this poem will make me think of Syl. She is Syl. She brings a primrose home to me. greenery by, in the forthcoming days of its disappearance. Let those lines symbolize chlorophyll. to glint against the twilight. And the quilt, and the shells, and the lantern. +++++ All our pain, go into the bullet. +++++ And bullet stay buried in the bottom line. and venus-flytraps carted over flagstone. on all fours with the rams and uproot cabbage. Call the cows home. Call the reserves. Dwarf-stars and snails are in alliance. in hyacinth-shape on the plum-patterned plates. Let the sky go argyle with magpies. Let the waters plump paisley with shrimp. Let the triplets be an ellipsis. a hole in the long, looped radio wave. of gas, and smells his niece’s breast. in the digestive fluids. Keep him whole. Albert Goldbarth is the author of over twenty books of poetry, and has twice won the National Book Critics Circle Award in Poetry. He is also the author of five collections of essays, including Many Circles (Graywolf), winner of the PEN West Creative Nonfiction Award, and a novel, Pieces of Payne (Graywolf). His newest book of poems, Everyday People (Graywolf), is out now. 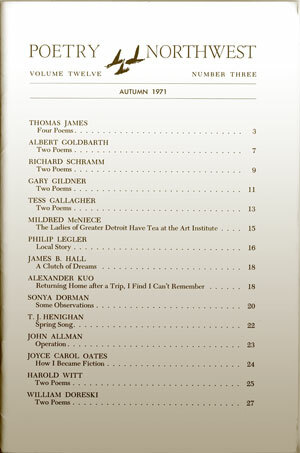 “Village Wizard” and “The Death of the Printed Page” originally appeared in Poetry Northwest Volume XII Number 3 (Autumn 1971). “Things I’ve Put Into This Poem,” “The First Amendment to the Constitution of the United States,” and “Against the Odor” originally appeared in Poetry Northwest Volume XIII Number 2 (Summer 1972). “The First Amendment to the Constitution of the United States” and “Against the Odor” are published in Jan. 31 (Doubleday) © 1974 by Albert Goldbarth. “Village Wizard” and “Things I’ve Put Into This Poem” are published in The Kitchen Sink: New and Selected Poems 1972-2007 (Graywolf) © 2007 by Albert Goldbarth. All other materials © 2012 by Albert Goldbarth.